Google Fred algorithm is dangerous for those bloggers who are use Blackhate SEO techniques. There have so many example for penalizing website by Google algorithm updates. This Google Fred algorithm is update on March 7th/8. Huge website owners and digital marketing firms is reported that they face change in their website traffic and rankings. This update mainly targeted low-quality content and backlinks in blog. Google doesn't give too much information about this updated. But they said that those blog is effected by Google algorithm updates who doesn't following the webmaster guidelines. How to understand your website is effected by Google Fred algorithm ? 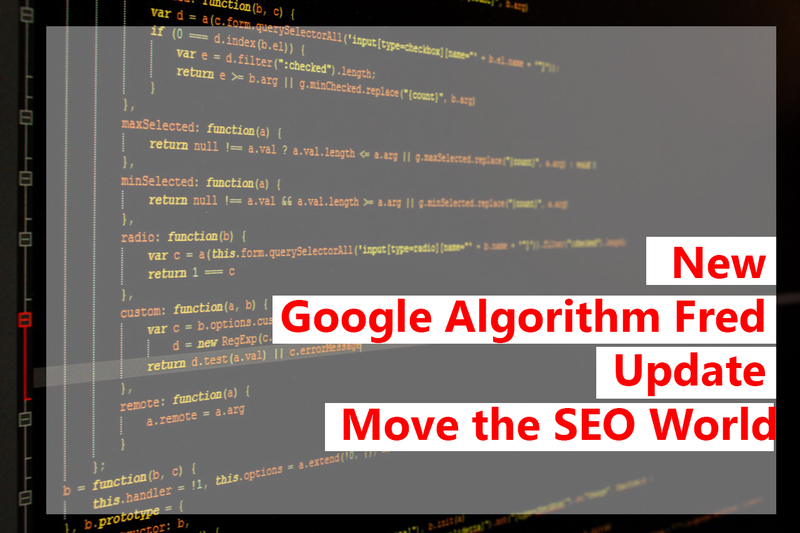 Google rarely announced that they update their algorithm. Because webmaster can change their tricks. Here I give you an indications about your blog affected by Google Fred algorithm. Google analytics will help you to understand your penalty. If you see your traffic drop between March 5 to 20, then your blog was effected by Google Fred algorithm. You also see your keywords position was ripple by Google Fred algorithm affect. How can rise from inflict a penalty on Google Fred algorithm?? Here I bring you some solution about what you doing after propagate by Google Fred algorithm. And what mortification needs to do for future?? A really longer post is better than some short post. Once a time blogger think that short post and more post is better for increasing website traffic. So 300 to 500 words post is very popular. Everyday blogger published minimum 2 post. In spite of the fact Alexa Ranking was very popular since those days. So the blog popularity was criterion by Alexa Rank. To increase Alexa Rank is very easy if you follow some simple steps. A. post regularly 1 more everyday. C. Building backlinks even bad or good. I am dam sure, this three techniques will increase your Alexa Rank rapidly. But Google Fred algorithm is holding such blog. Because a 300 to 400 words article is not able to gather all information. So when visitors see the post on Google first page, they will despondent about Google search engine results. So Google Fred algorithm remove those short article from Google search results. Now the time for writing longer post. According to Neil Patel 27 SEO Essentials for Every Long-Form Blog Post, long post got thousands of visitors rather than short post. He write 10k to 20k words long article. Because he gathered every data on his post. So if your blog is full with short article, please remove it as soon as possible. Google Fred algorithm will penalize your blog and organic traffic will decrease dramatically. Try to republished all of your post by adding full data. Do not write a post below 1000 words. Try to write some pillars post in 10K to 20K words. Do you think nothing to needs organics traffic from Google?? No it's great mistake. Once a time Google will banned your blog from indexing. 2. Do not use any Black/Gray Hat SEO. Recently I learned about black Hat SEO. Very and very bad idea for increasing organic website traffic. After than people use this trick for increasing website traffic because they produce less quality content. Keyword stuffing is one example of black Hat SEO. When Google indexing your blog, keywords is most important to it. Because the visitors search by keywords. So keywords stuffing are very good for increasing website traffic by black Hat SEO. You write a post by repeatedly using some words. Then Google will index your post for those keywords. But there have no information according to blog title. Gray Hat SEO is born by mixing white hat SEO and black Hat SEO. Nothing is acceptable by Google Fred algorithm. Any kinds of trick you use for increasing website traffic, you will be penalize Google Fred algorithm. Yeah, Google is a great source of websites traffic, but it doesn't mean that you write for Google. Supposed you write a post by strongly researching keywords on Google keywords planner. So write a post by using the short and Long-Tail keywords. But your keywords don’t match with your sentence. Google New algorithm Fred will detect your website as bad writers. It will decrease your website traffic by decreasing Google page ranking. So before publishing new articles, think about human not Google. Because you must be satisfied your visitors by article. When Google Fred algorithm detect that your post got more sharing and 0% bounce rate, it will show your post on the top of search results. If you got huge Backlink from other site, you may warning of Google Fred algorithm. Because the old SEO analyst suggested to build backlink from other site for improving search engine rankings. So the blog owner trying to make backlink from any website. They also buy backlink from high ranking blog. But this methods is so bad for increasing search engine optimization. New algorithm updates will automatically detect your backlink if they are buying from other. It's only count those backlink which are got naturally. So immediately check your backlink and remove them. Do not buy any backlink from other sites where the main keywords is different from you. Focus on creating few quality content rather than creating big amount of cheap and short content. Remember this is 2017. Here people always search for quality content. There have millions of blog, website, forum for giving information. So the quality information will increase your search engine acceptability. Google Fred algorithm will penalize those blog who produce more short content without conforming quality. Quality content is that content which has all the information according to post title. No fake information was in post. I know that your blog is about earning some bucks for lives. It's not an easy task to make money blogging. There have so many options for make money blogging. Supposed Google adsense, paid advertising, paid posting, affiliate marketing and more. All the methods will drive visitors from your blog to another site. So it's reduce your blog authority to visitors. Supposed you write a paid post for affiliate marketing. So when visitors read your post, they will redirect your blog to another site. So your blog bounce rate will increase. Besides that, if you use more ad's in your blog, it's take time for loading page. Visitors feel bothered to stay your website. So if you want to make safe your blog from Google Fred algorithm, reduce your blog ads. Google Fred algorithm is not bad for those who really working hard for increasing website traffic and blog authority. Because some blog owner trying to make SEO by illegal way. So their website got first page rank of Google search engine. So the real bloggers lost their willing to write more. Google Fred algorithm will help those bloggers to increase their blog authority and increase website traffic. If you are affected by Google algorithm. Please follow the upper instructions for avoiding website penalty.